Data is from the February 2018 Verndale report titled "Customer experience (CX) journey research." 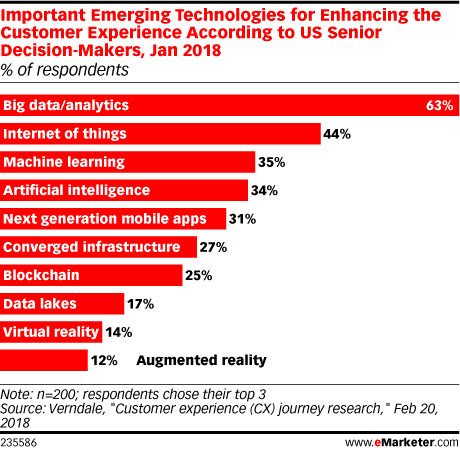 200 US B2B and B2C senior decision-makers from various industries, with involvement in the customer experience journey, were surveyed during November 2017-January 2018. Respondents identified their company global revenues as being less than $50 million (20%), $50-$100 million (42%), $100-$250 million (32%), $250-$500 million (35%), $500-$750 million (31%), $750 million-$1 billion (26%) and $1+ billion (14%). Verndale is a marketing technology agency.